The settlement near Chouteau in Mayes County is over 100 years old, having been founded in 1910. Chouteau is not a large community, given its age. But it is the largest in Oklahoma, and the largest Amish community west of the much more heavily-Amish states of Iowa and Missouri. As of 2011, the Chouteau community numbered 4 church districts, around 600 people. Most of the first Amish to settle at Chouteau came from Ohio. The most common last name for Amish in this community is “Yoder” (Encyclopedia of Oklahoma History and Culture: Amish). The Chouteau Amish are known for its liberal use of tractors, which, unlike most Amish, they use in the fields. Tractors are considered a necessity due to the difficult-to-work soil in the region. Most Amish do not permit tractors to be used in the fields due to their similarity to cars, though many Amish will allow tractor engines to be used to power machinery near the barn. In addition to farming the Chouteau Amish run a variety of businesses. There is a bit of a tourism industry at Chouteau as well. The Amish Cheese House, as well as the Dutch Pantry, are two of the food attractions. Ropp’s Farm and Bakery is another venue providing baked goods and sweets. At least one retail store selling Amish-made furniture can be found in Chouteau. The Amish community at Clarita was founded in 1978 by a relatively conservative group of Amish from Ohio and Indiana. The group is just a single church district in size, despite it’s 3+ decades in existence. Like the Chouteau community, the Clarita Amish also allow tractors to be used in the fields. Tractors have been used since the community decided in favor of it in 1994 (with the requirement that they be steel-wheeled). The justification for tractors was the difficulty of working the region’s hard-packed soil with horses (“Some Amish to Use Tractors; Those Opposed May Move”, The New York Times, April 16, 1995). Miller added: “The reason we agreed to go on and use the tractor ourselves, own the tractor, was so that more of our young people can stay on the farm and raise the family at home” (“The Simple Life”, Ralph Marsh, Oklahoma Today, September 1996). As a result of that decision, Amish who objected moved away from the community, which may be one reason it remains a small size today. Amish here have also gotten steadily more progressive in other areas of technology, adopting power lawn mowers and garden tillers as well (“The Simple Life”). 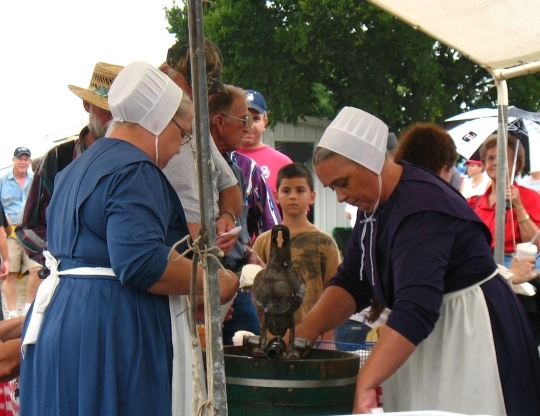 The Clarita community is also known for the annual Clarita Amish auction and sale, benefiting the Amish school, and which they have held since 1988 (Encyclopedia of Oklahoma History and Culture: Amish). The event features quilts, buggies, baked goods, and a range of other items, and attracts large crowds. The auction is held each year on the second Saturday in September. Amish have attempted to settle Oklahoma a few times in the past. The first community founded in Oklahoma was located near the town of Thomas in Custer County. This settlement was quite long-lived, lasting from 1893 to 1960 (The Amish in America: Settlements that Failed 1840-1960, David Luthy p. 375). The Custer County settlement was started by Amishmen who acquired their land during a “land run”, in which the government opened up areas of the Oklahoma Territory for settlement. The first Amish to set up shop in the area came from Amish communities in Kansas. Other Amish came from Mississippi, California, Nappanee, Indiana, and the Arthur, Illinois Amish community. David Luthy explains that the land offered in such land runs was not choice, but that “people who had very little money were glad for the opportunity to settle there”. Oklahoma itself did not become a state until 14 years after Amish had settled there (Settlements that Failed, p. 375). Along with the Old Order Amish settlement, a more progressive Amish-Mennonite congregation also developed in Custer County, with the two groups interacting and even attending church services together, especially during the early years. Many of the Amish living here were quite poor, as were their numerous Indian neighbors. To make a living, Custer County Amish grew wheat and did 3-4 day hauling trips, aking grain to market in order to supplement income. Many of the Amish lived in dugout houses. Eventually railroad tracks were laid through the county, which improved the area’s fortunes (Settlements that Failed, p. 378). The end of this settlement came about due in part to the adoption of the tractor in 1937, which one can find in today’s Oklahoma Amish communities of Chouteau and Clarita. The tractor was cited as a main factor in eventually adopting the automobile. After the tractor, electricity arrived to Amish homes as well. Some of the Old Order Amish then moved away, while the remaining members affiliated with the Beachy Amish. The departure of the last Old Order Amish person in 1960 brought the Custer County settlement to an end (Settlements that Failed, p. 383). A second settlement was founded in the vicinity of Watova in Nowata County in 1931. Settlers from Hutchinson, Kansas founded this community, attracted by the cheap farm land available in the area, affordable for a depression-era farmer (Settlements that Failed, p. 385-6). Amish settlers came to Nowata County from a Virginia Amish community, as well as Custer County in Oklahoma. Conditions in the area were difficult for farmers, though. The settlement battled drought some years, too much precipitation in others, and generally faced poor growing conditions. The Nowata County’s bishop died in 1941, and the remaining families moved away over the next two years, bringing the community to an end in 1943 (Settlements that Failed, p. 386-8). Today, the Oklahoma Amish population is not exactly growing like gangbusters. Unlike some other Western states, Oklahoma has not attracted much new settlement in recent years (see Colorado Amish). 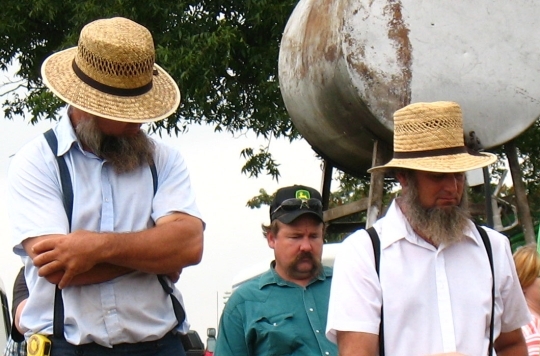 In the Young Center for Anabaptist and Pietist Studies’ 2010 review of the past two decades of Amish growth, Oklahoma turned out to have one of the slowest-growing Amish populations, at 25%, vs. an overall Amish average of 102%. But Oklahoma’s two Amish communities are hanging on, despite the challenges of farming in what their Eastern cousins might find to be challenging turf. They may use tractors a bit more liberally than most Amish, but have carved out a living in the Sooner State for over 100 years and counting. I am not surprised there are only two communities of Amish in Oklahoma, that sure is some hard red clay/dirt and very hard to farm. It also does not surprise me they allow tractors and tillers. They would be very hard pressed to be able to farm without them. Even with them the farming can be hard. Thanks for the article Erik. I love your state guides they provide a wealth of information. Thanks Alice! Glad if anyone finds them helpful 🙂 I do enjoy learning more about these communities as I put them together. Thanks for all the information you have posted. I wanted to take some friends down to the Miller’s for lunch. How do I contact them for a reservation? Laurie, hope you don’t mind if I am not Erik. The phone number for the Miller Farm in Chouteau, Oklahoma, is 918-476-6817. They are Amish and serve meals in their home to large groups. Their son, formerly Amish and now Mennonite, also does the same. Fannie’s Country Cookin’ is at 918-476-7891. We are hoping to make a trip to the Miller farm soon from Oklahoma City. We also have a small guesthouse in our home. We are a Christian home (English though) and house international students and travelers very cheaply and would love to host traveling Amish. We are the Peter Burtons and may be reached at 405-200-1930. Laurie, there are also four other homes that serve an Amish dinner in Oklahoma. That famous red dirt can get pretty hard when it dries out, that is a fact. It is not all red though. Several years ago I read an article about some Amish that were giving up on Oklahoma; in fact it may have been one of the articles that were listed as references at the end of Erik’s thread, and the man being interviewed said that when they came to the particular location Oklahoma they we were initially attracted by the black soil. He said they always looked for black soil in the more eastern states because they new it to be rich and fertile. What they didn’t realize was the black soil in Oklahoma was black because it had higher clay content and that clay had a black tint to it, whereas the black soils where they came from were loamy soils or a mix of sand, silt and clay with a high percentage of organic matter, which resulted in the black color. Both were “blackland” soils, but had completely different characteristics when worked. I don’t recall which community he was from, but I suspect it was the one at Clarita. He said the heavy soil just proved too much for the motive power they had available; their horses. This is the exact reason that many of the blackland soils along the coast were never farmed until tractors were invented. Farmers literally wore their horses out trying to turn soil that was too dense and heavy to be worked with the light equipment that horses could pull. I never thought about the aspect of the turned soil drying out too quickly, but probably should have. We once leased a farm that had black, heavy soil. The local people always referred to it as “thirty minute” soil. One time I asked a neighbor why they called it such a strange name. He said if you came at 11:30 AM to plow it would be too wet; if you came back at noon it would be too dry. That may be a bit of an exaggeration, but not too much of one! Oldkat–you got it. I do believe this was in the piece from Oklahoma Today, which I read a few days ago. Nice article by the way. Thanks to the article–and now your comment–I know a bit more about soil than I did before! Pretty interesting, actually. I grew up in the red-clay NC Piedmont. i want to know how i would go about getting a amish pen pal? Is there a phone number for one of the Clarita Amish cabnet makers. I am building a house and would like to contact someone about making kitchen cabnets. Thank you. Thanks for this reminder of the Amish here in Oklahoma! I moved out here (Oklahoma City) almost a year ago from the Washington DC area and would visit the Dutch market in Laurel, MD often. As well as make yearly trips to Bird-in-Hand, PA. When I found out we were moving here, I was sad to see my trips to Amish country go. Thanks to all your research Erik, I now know where to go here in OK! Interesting Melanie. Are they horse and buggy? Not Mennonite? Started in the last year or two? Sometimes they take time to show up on the radar, or if it’s just an isolated family or two they might not really be considered a “settlement”. According to the latest Raber’s Almanac there is another small community in NE Oklahoma near the town of Welch (Craig County). I don’t know much about that one but am guessing was settled recently (or possibly existed before but never reported to Raber’s as it is not listed in the 2011 edition). I have seem Amish / Mennonite (one woman was driving a van) in Chandler and Stroud towns, but not often. I talked with one family and they said there is a church south of Perkins. Very young family and nice. I’ve heard Thomas is not a dead settlement BTW. Melanie, if you’re speaking of the community in Custer county (Corn), I believe it is Mennonite, not Amish. Beyond that one, I’m not aware of another one out there. Corn is also the hometown of John Denver if I remember correctly. Not exactly relevant, but interesting. By the way, the Corn Cafe has amazing food prepared by the wonderful ladies of the church. I have seen signs warning of horse-drawn vehicles near Durant, Oklahoma. Could there be Amish there? Durant is south of Clarita, OK. Take highway 48 out of durant and stay on it till you get to Clarita. I don’t believe I asked the location of Durant. I was born there and know it well. My question was about whether there are Amish nearby. I believe this was referencing the proximity of Clarita to Durant, but good job being snotty to someone trying to be helpful. i think it would be interesting to explore the amish way of life. i am intrigued by there ways of going about things.I know a couple amish young men and women =,but to live in their sheo’s for a moment i think would be a unique experience. I am an avid gardener. I have read some about Amish and Mennonite farming techniques and have decided I would like to learn more. Is there an opportunity in Oklahoma to learn first hand. I would like to ask questions and I would like to buy some heirloom seed. Hello, I want to grow as green as I can, therefor I am in the need of donkey harness for pulling a garden plow. I plan to grow an acre of organically produced vegetables to sale to help make my rural farm help pay the costs of our mortgage and feed bill. My apologies, his grandparents lived near Corn. Thank you for the article. I grew up in Chouteau, Ok; the vivid picture you painted made me a bit homesick . The Amish homes and shops are well worth the visit. My name is Shayna Benedict and I am a consultant for TrueStar Health. TrueStar is a World-Leading Health and Wellness Company with the most comprehensive online healthy lifestyle resources. A professional study with Nutrisearch Comparative Guide to Nutritional Supplements was performed and TrueStar was given a 5/5 Gold-Star Medal and ranked our products #1 out of 1,500 other companies that participated in the study. TrueStar proudly offers the highest rated supplements and multivitamins represented by top health care practitioners. TrueStar’s products have been introduced to the Amish Communities in Texas, Missouri and recently Iowa and the ones taking the products are now feeling better than ever! Oklahoma Amish Communities have not yet been introduced to our products and I would like to be the one to do so. I am needing to get in contact with these communities, so if you have any known resources would you please let me know? I am from Muskogee not far from Chouteau where a large Amish community is and know several Amish families. Sorry to burst your bubble but, they are not going to care about Medications and supplements. I’ll ask around, but they normally do not buy these types of products. Is there a place where you can buy Amish Quilts? I am looking for local Oklahoma Amish made harnesses for horses. Any idea where to find a craftsman? Check this link out for local businesses, including tack work. I’ve had the Millers (Amish) do concrete work and they did an excellent job. I would think most of the businesses are owned/operated by Amish residents. If you ask, they will let you know for sure. Good luck. I live just south of Clarita, OK and am looking for an Amish Meat processor for my cattle. I heard a rumor recently from a local resident that the Amish in Clarita have built a stainless steel processing facility, also open to the public (for a fee of course) but have not been able to get any more details about it. If anyone has information about this, will you please contact me at my email or (469)964-8096. Thank you. I was fortunate to have a few days off work this last week so traveled to Oklahoma to meet my sister in Tulsa, and see a few Amish communities along the way. Westville is made up of Amish that don’t own their own places. Many, if not all, have contracts with the company Tyson. They are hired in to raise chickens for a period of time. During this time they live in English houses, which makes it really hard to find them if you are a tourist like I was. I could barely see the buggy the one person I visited had. According to this person, a woman that writes for The Budget, and Amish newspaper, there are some 5 families that stick with the more traditional Amish ways of living and another 8 that don’t. Welch now has 7 Amish families. They had 8 but one recently moved to Princeton, Mo. I sat and chatted with the Bishop and later with the guy that writes for The Budget for the area. Nice people I hope to get back to visit with again someday. Hi-Are you sure about the founding date for the Chouteau group? You list 1910 yet a settlement and the Amish Cemetery appear on 1898 GLO maps. I’m not a historian, but 1910 is given in a number of reputable sources including GAMEO. Sometimes one or two families may live in an area before it officially becomes a settlement, but that doesn’t sound like the case here since 1898 is 12 years earlier. There have been failed settlements in Oklahoma; sometimes an Amish community exists in a general area, dissolves, to be replaced by another later. I kind of doubt that is the case here too, but if you have the book Amish in America: Settlements that Failed 1840-1960 (by David Luthy) you could check. Not sure how much info the map you refer to gives, but is it an Old Order Amish cemetery or that of a different group using Amish in its name? That’s another possibility, the latter 1800s was a time of transition with a number of related groups forming which were more progressive but still used “Amish” in their names while the Old Order emerged. My dad was born in Chouteau ,Oklahoma,and my grandpa was an Amish Bishop there for 25 plus years, and while there are a lot of nice people there, is another side that the public seldom finds out..
What is the other side that you are talking about. I still have uncles, aunts , and cousins there.. The last time I saw some of my cousins, some of them were dead drunk, as was right after a huge beer party. My one uncle admitted that he made hundreds of dollars in the afternoon of church Sunday in gambling with cards. Thanks for the follow-up fellow pilgrim. It is hard for us outsiders to know what goes on for sure in these places, but your first hand account is something to think about. Some will say it’s all a big lie, though I too have seen some of these things happen as well. For what I have seen most Amish do not do these things nor would say they are the right things to do. My family stopped in at Chouteau last week while traveling back to NC from Tulsa. We had a chance to visit at The Cheese House and the Dutch Pantry, where we had the buffet for supper. The thing that struck me is the use of tractors for both farming and for transportation. I don’t know what they do to them, but they will really get up and go! I thought it was an ATV it was moving so fast, when we saw it from a distance. One of the ladies in the Pantry said they had been using tractors for farming for many years, because of the hard land and the humidity being hard on horses. Sadly, we didn’t get to see a whole lot of the community, as we were on a bit of a schedule, but it’s nice country, and the folks we met were friendly. Worth a visit if you are passing along Oklahoma rt. 412 between Tulsa and Siloam Springs, Arkansas. I would love to visit the Amish community and meet them. Would I need to get permission to this? I don’t want to be disrespectful and just show up. Meeting the Amish is not like going to meet the Pope, or most any other high ranking group of people. The Amish don’t have a central building that you will meet them at. They have their Sunday church meetings (Gmay) every other Sunday but these are not open to people just dropping in. Plus since they alternate this service at different peoples homes it would be tough to find, even IF they allowed “English” people to attend. I personally go around and meet the Amish people that write for the Amish newspapers and also go to some of the stores run by the Amish. Most of these stores are located on the property of the Amish family, not in any downtown location. There are few exceptions to this but don’t be fooled by most places that list “Amish” this or that on their storefront. They might sell Amish goods but most are not Amish themselves. Are you thinking about visiting people near you? If so, where are you at? Some people here might be able to recommend places to go. As I see it Grace you have a couple of options. Chouteau Oklahoma is about 270 miles from you, over by Tulsa. They have about 100 Amish families that live in that area, 4 church districts I think. Then you also have Clarita and Coalgate Oklahoma that would only be about 127 miles South East from you, but they only have one church district… probably about 28 families. Chouteau would be a nice place to visit but be aware that they mainly use the horse and buggies on Sundays and holy days. I am not sure about the Clarita area. Grace, if it fits in your schedule, you would be welcome to attend the Annual Clarita Amish School Consignment Auction, Clarita, Oklahoma. It is tomorrow, Sept. 13, at the Miller farm, at the intersection of State Highways 48 and 31, to raise funds for the local Amish School. You would also be welcome to visit any stores when they are open. This is a BIG event, as told to me by Amish in Chouteau. I think they told me there is something like 20,000 people that attend. I only wish i was closer to go to it. My wife and I just attended last weeekend the auction for Clarita Schools. O my, whta a treasure we have found. WE will definitely be back next year with more money saved to purchase some items that are hand made. The breakfast probably had the best sausage I’ve ever eaten. Home made ice cream was WOW !!!!!!! Great way to spend a day for these Texans. Is there an Amish store in the Clarita, OK area? I’m trying to find a place to purchase Clear Jel (Gel) for home canning and I’m told that the Amish stores are the best places to find it. I’ve also heard about all the other wonderful things to be seen in some of these stores, so I’m hoping there is one near me. Thanks. Are there any groups of Amish who build homes in the Chouteau area? Thank you. The Amish Budget scribe of this above community died this past week while he and his wife were visiting his mom and relatives in Ohio. They had a short viewing of the body here, then took him to Oklahoma for burial close to their only child, they buried there after an accident…. He was a 1956 model, and I knew him well. I am trying to live with the Amish in Oklahoma over several weekends since I work during the week. Does anyone know how to reach them? When is the Clarita School Auction in 2015 and can you send me directions on how to get there. Thank you. 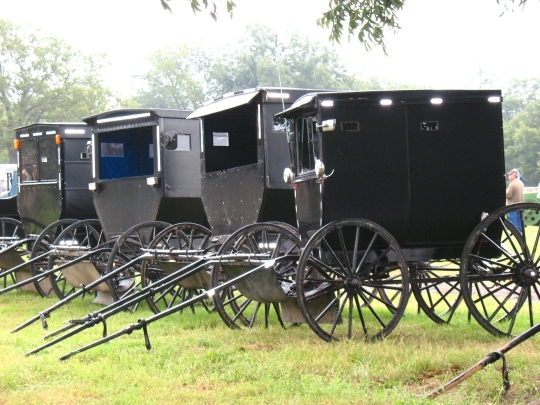 Carrie, the annual Amish School Auction, Craft And Antique Sale in Clarita, Oklahoma will be held on September 12, 2015. The second Saturday of September each year an auction is held on a farm near Clarita to raise funds for the local Amish School. The address is 37129 State Hwy 31, Clarita, OK 74535. Directions: From State Highway 48 (between Tupelo and Wapanucka), take SH-31 east two miles, then go south on SH-31B. Take SH-31B south 1.5 miles and follow the signs. If not next year for sure! Drove past this weekend, and Ropp’s Farm and Bakery’s sign had a big CLOSED sign on it. I am extremely interested in the Amish and would love a chance to meet and get to know their ways of life, learn more, and get a better understand as I feel drawn to them, and haven’t been able to reach out and learn like I’ve wanted/needed! If anyone can help me, my heart and soul would be forever grateful! I have always felt connected to them, and would love to know and learn more!